Local health officials disagree about the need for protective gear for cleanup workers of the Chevron pipeline oil spill throughout Salt Lake City. ---Despite press conferences being held there and an official reopening of Liberty Park Sunday, a doctor from the Salt Lake Valley Health Department says, "Just stay away, that's the most important thing." Also, Rocky Mountain Power, whose downed power line has been accused of contributing to the pipeline breach, describes "Chevron's theory" as "plausible," but if true, "it would an extremely unusual event." Salt Lake City and Chevron officials say air quality levels in effected areas are not toxic, but health officials say those who become ill from the fumes are advised to seek fresh air immediately. Symptoms include tiredness, head ache, nausea and vomiting. Red Butte Gardens director of events and visitor services says the smell has completely cleared from the gardens areas and "The show must go on," and will do so. Comedian Steve Martin is scheduled to perform Wednesday. Red Butte also plans to host its annual gala Friday as scheduled, said director of events and visitor services Derrek Hanson. Hanson said the pipeline leak was downstream from the amphitheater and greenhouses. Health officials are more closely monitoring Liberty Park. Chevron and government officials say Liberty Park was chosen as a collection pond where oil would be most easily recovered. "Certainly a large quantity of [oil] was collected in the lake at Liberty Park, and that was intentional, to some degree, because it was a lot easier to collect," said Salt Lake Valley Health Department environmental health director Royal Delegge. "Whenever you have a large area of product, it allows for more evaporation of the product. ... But right now we're not asking anyone to ... evacuate. We don't see the need for that at this point. [But] if they start to suffer symptoms, they should see a physician." Air quality data at Liberty Park has only been received in the last two hours by the Salt Lake Valley Health Department, Delegge said, which is working in conjunction with the Utah Department of Environmental Quality and U.S. Environmental Protection Agency. Previous air quality data was collected by HazMat/Fire crews. Delegge says he was not involved Salt Lake City's discussion that preceded the reopening of Liberty Park. Mayor Ralph Becker's spokesperson Lisa Harrison-Smith said "we felt there was not a concern with being near the lake but more coming in contact with the lake." The fire department also assessed explosive risk in the early hours of the spill Saturday, Harrison-Smith said. Delegge said that cleanup crews do not need respiratory protection, even those working directly with oiled stream beds and shorelines. "From what I know, that is not necessary," he said. That conflicts with the advice of his colleague Dr. Dagmar Vitek, also of the Salt Lake Valley Health Department, who said "the risk to health is actually very minimal" for most visitors of affected areas, but that cleanup workers should be protected. "I know when the cleanup is going on people who get on their hands an knees and are going to be physically cleaning the area, those people absolutely have to wear protective equipment," Vitek said. Cleanup workers will primarily be employed by contractors for Chevron, Delegge said. He said the health department has no authority to enforce worker safety during the cleanup, but Harrison-Smith said she believes the U.S. EPA could insist that workers wear respirators, for example, if that was deemed necessary. Salt Lake City resident Deb Henry visited Liberty Park yesterday afternoon shortly after it reopened and later fell ill.
"My head was kind of spinning. Then I laid down, I decided I was going to take a nap. I grabbed the garbage can just in case. I puked, then I went to sleep for four hours," she said. "After that, I was fine." Henry said the smell at Liberty Park was very strong Sunday and she spent one hour there. Why did she go? "I'm worried in general with the oil spill down south and the oil spill here that we're not getting information that we need and I wanted to have it first hand." Delegge said preliminary air quality reports are "positive." 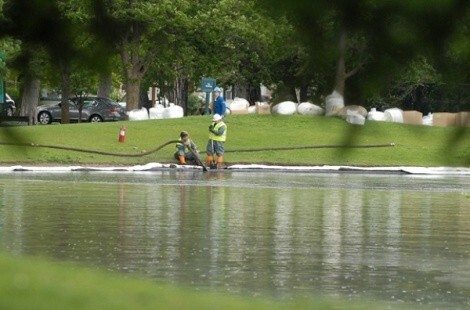 Harrison-Smith warned that air quality may change if temperatures rise; evaporation, of the pond at Liberty Park especially, could increase the amount of fumes. Rocky Mountain Power spokesman Dave Eskelsen says Chevron has requested information regarding the power outage in an effort to determine the cause of the spill, but that no government agency has thus far done the same thing. "There is an official inquiry that Chevron is conducting," Eskelsen said. "They've asked us to supply information about the power outtage. ... We're willing to help gather facts and determine exactly what happened." Eskelsen said one worker responded to a 9:19 p.m. power outage Friday caused by a tree branch near the pipeline breach. Eskelsen said the worker did not notice anything amiss regarding the pipeline at that time and was able to fix the power line quickly and leave. Eskelsen said he could not estimate how close the repair area is to the breach in the pipeline. Chevron earlier stated that crude oil gushed from the hole at its fastest rate soon after the breach. "There was no indication at that time that our lineman noticed," Eskelsen said. The power line made contact with the tree branch (see correction below) in an area protected by a 7-foot chain-link fence where the line transitions from overhead wires to underground, Eskelsen said. Both companies were aware of each other's operations in the area. Chevron mentioned the fence as a possible contributor to the oil spill during a press conference earlier today. Currently Chevron estimates that 31,000 gallons of crude oil spilled into Red Butte Creek, flowed down to Sunnyside Park near 1100 East, onto Liberty Park pond before reaching the Jordan River. That estimate is currently being verified by the U.S. Department of Transportation, Chevron says. Correction 1-14-10, 4:06 p.m.: Rocky Mountain Power spokesman Jeff Hymas says the power outtage was caused by contact between a tree branch and the power line under high winds, but that the transmission line did not break as this story originally reported.